Are you guys familiar with onigiri? They’re Japanese rice balls and they’re incredibly popular as a simple meal or snack. Even if you haven’t eaten them before, you’ve probably spotted the onigiri emoji – it’s the white triangle (rice) food item with a tiny black square (seaweed) at the bottom. Onigiri are ubiquitous in Japan; walk into any convenience store and you’ll find a wall of triangular (and round) onigiri just waiting to be eaten. The first time I was in Japan, I spent hours in a 7-11, which is nothing like the 7-11 around these parts. In Japan, they have fresh salads, grilled meats, bentos, and of course, a huge variety of onigiri. I remember standing in front of the fridge onigiri display for so long that I was worried I would get kicked out, but of course the ever-polite Japanese clerk didn’t bat an eye. 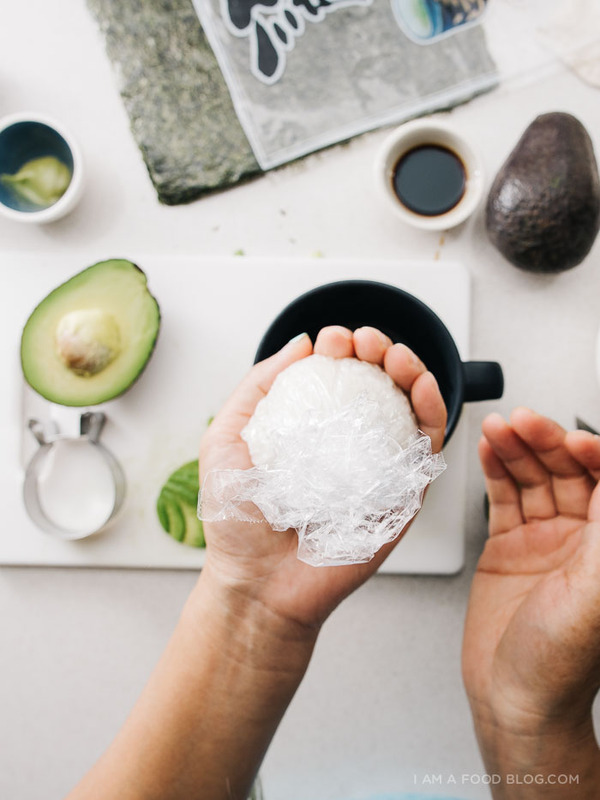 You can buy onigiri on ever street corner in Japan, but it’s one of those things that you can very easily make at home. Plain or salted rice is gently compacted around a filling. Some onigiri are wrapped in roasted seaweed and some aren’t. Unlike sushi, there aren’t a lot of hard and fast rules, which makes it perfect for experimentation. 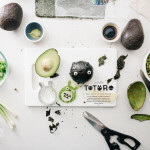 I filled this little Totoro Soot Sprite (Japanese dust bunny) with a mix of avocado and green onions mixed with a bit of soy and wasabi. Roasted seaweed was wrapped around the rice and mozzarella eyes with seaweed pupils completes the picture. He tastes as cute as he looks. 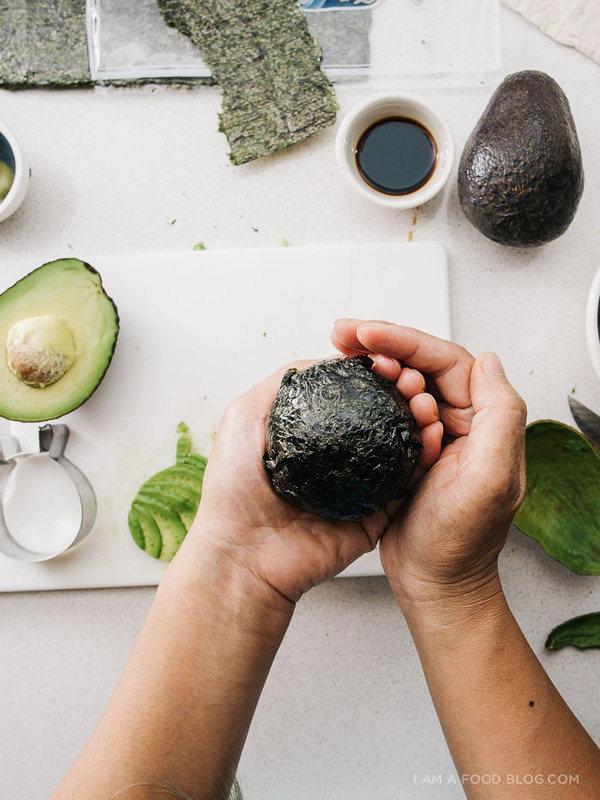 I love avocado rolls so it’s no surprise that avocado onigiri is just as delicious. Creamy avocado, fresh green onions, savory soy sauce, a hint of spice, and roasted seaweed – this is my kind of snack! Please check out Lyndsay’s My Neighbor Totoro Cake Tutorial and Vickie’s Totoro donuts. I’ll be rounding up all the Totoro posts on Friday, so be sure to check back! 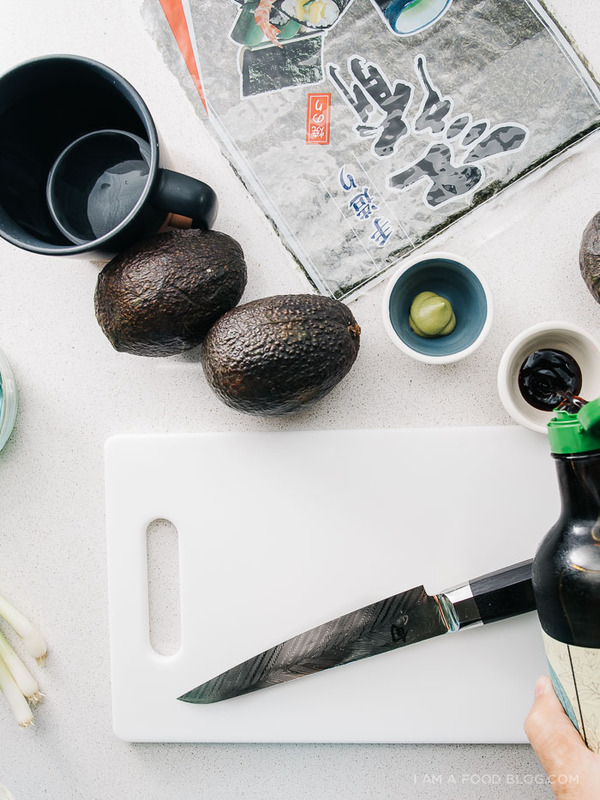 In a small bowl, mix together the avocado with green onions. Season with a bit of soy and wasabi to taste. Take a sheet of plastic wrap and place it into the bottom of a small cup. Place 3/4s of the rice into the cup and press down slightly to make an indentation. Fill the indentation with the avocado filling and top with the remaining rice. 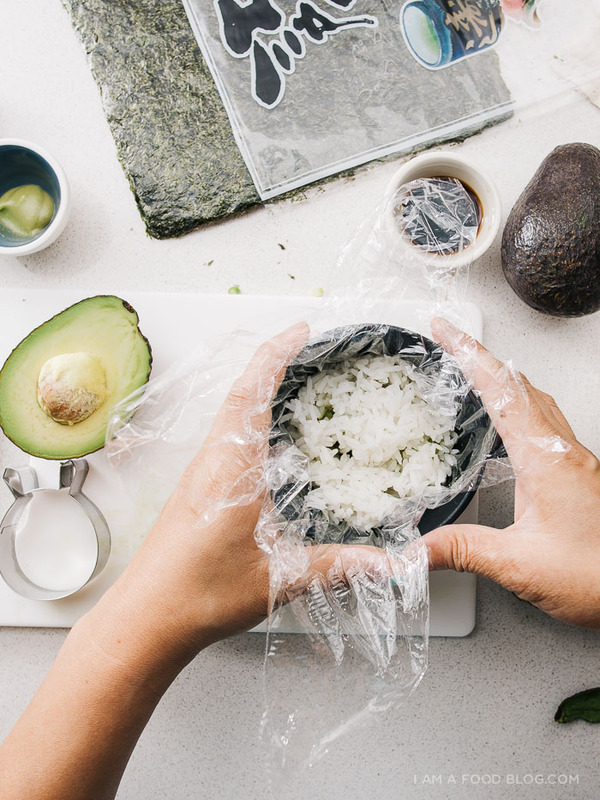 Gather the plastic wrap, twist, and compress the rice into a compact ball. Remove from the plastic wrap and fold the seaweed around the rice. The heat and moisture from the rice will re-hydrate the seaweed so you’ll be able to smooth it down. Trim off the excess seaweed with a pair of scissors. 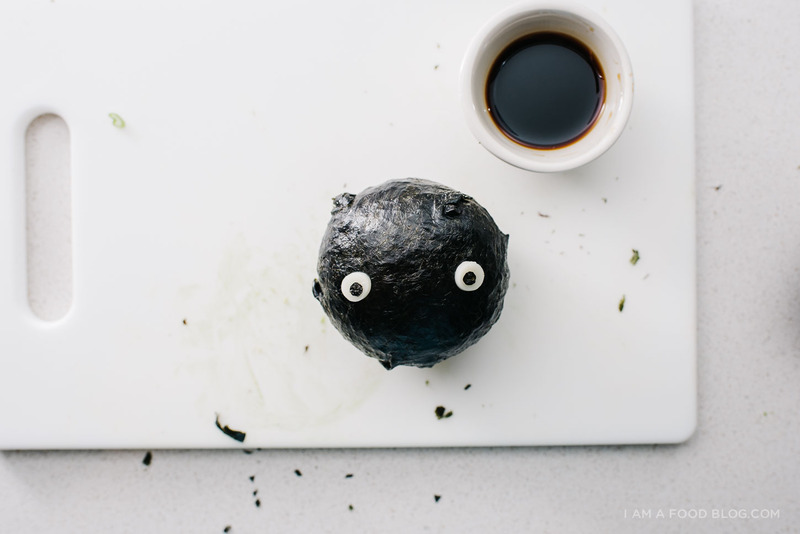 Place the seaweed pupils on the cheese eyeballs and place on your onigiri. Enjoy! Note: You could also use your hands to shape the onigiri. If you’re using your hands, be sure to keep them damp with water so the rice doesn’t stick. It’s #totoroweek! 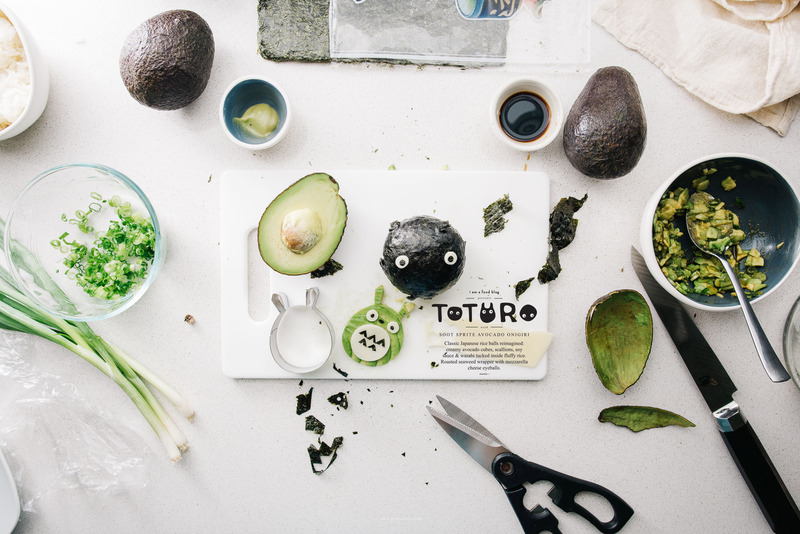 Be sure to check out all my other posts of food dressed up as Totoro and Lyndsay’s Totoro cake tutorial! I’ll be posting a round-up of Totoro goodness on Friday, so hop on back here for that! omg. this is so cute. i’m dying. O M G ! ! ! ! ! So so so so soooo cute!!! also known as PARTY BALLS! these are so hilarious and cute. i can taste the crunch and flavours right now. i should make these with TEDDY! we have been making udon and soba noodles out of playdough using the “extruder” … 7-11 and LAWSON STATION in Japan … totally memories… also, your perfectly sliced fanned avocado punched-out Totoro is so good, too! ^__^ you so smart!! Hehe!! These make me giggle! I LOVE totoro. 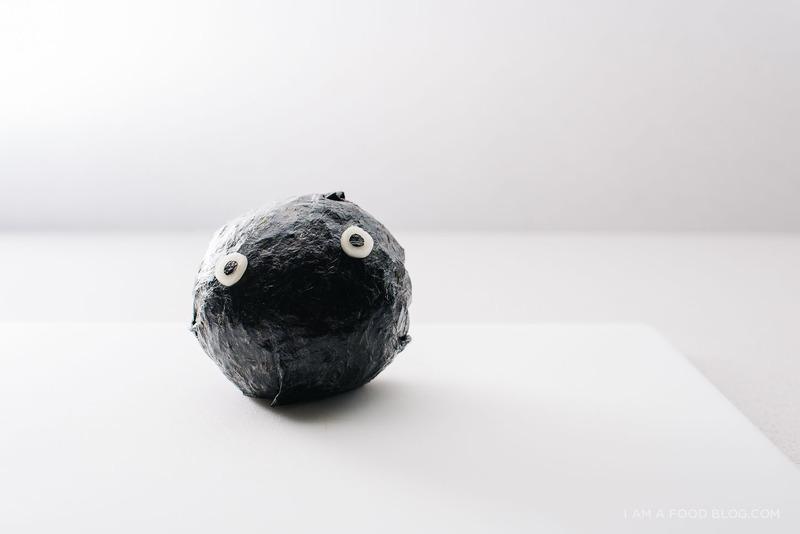 The soot balls remind me of Spirited Away (which is my all-time favorite movie). I love how simple onigiri are; I definitely want to try making some! Thanks for all the cuteness! This is so adorable I almost can’t handle it. Yay for Totoro Week!!! This is the cutest post I’ve seen all week. I LOVE the first photo – it’s fantastic! 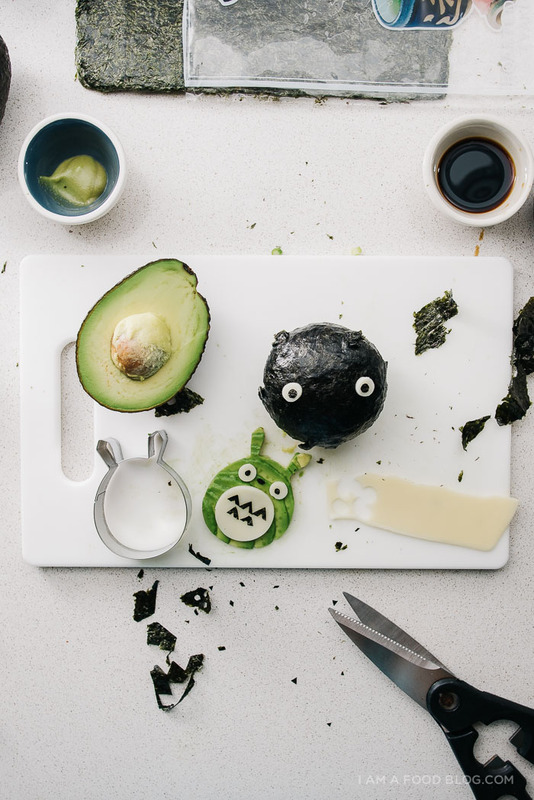 Me encanta Totoro, pero no me gusta el aguacate. This sounds very good i may even try it at home! I have done something like this before but not with avocado it was some sort of fruit. When I was looking through the ingredients I saw wasabi. This must be pretty spicy. I would recommend something more sweet, not spicy. This seems like a simple fast and easy recipe to make if you are in a hurry to go somewhere.